No matter how old you are, learning something new should thrill you. The day I lose that feeling of wonder and awe will be the day I hang up my pots and pans. Today I not only learned about the Island Nation of Kiribati, a country I'd never heard of, but I had the privilege of sampling a little bit of the country's culture through it's food by making Lumpia spring rolls. 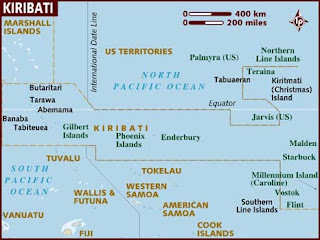 Located in the Central Tropical Pacific Ocean, Kiribati is an Island Nation that consists of 32 atolls and 1 raised coral island. The Island straddles the equator and to it's eastern most region, borders the international timeline. How cool is that?! Kiribati is one of the world's poorest countries, owing to its lack of natural resources. Moreover, due to global warming and rising sea levels, the country is predicted to eventually disappear, forever displacing it's people and way of life as a tragic consequence of man's stupidity and ignorance. Dishes in Kiribati are generally based on fresh fish, shrimp and crabs as well as coconut and coconut milk. Banana leaves, curries and rice are also commonly found staples. Some say the food is quite similar to that found in the Philippines, but this island nation certainly claims a culinary culture all its own. My first attempt at making the wrappers for the Lumpia was fairly successful for a rookie. After one or two false starts in which I under-cooked the batter and made the pancakes too thick, I got the hang of it. I was expecting something like traditional egg roll wrappers, but these are more like crepes. This recipe does not call for frying the Lumpia, but I decided to try it both ways, un-fried (pictured at the top of the page), and fried, pictured below. Both were delicious. If you want to be a little more health conscious, skip the frying. If you prefer a crispy spring roll, heat a little oil in a pan till it's good and hot and fry them up. Combine cornstarch, flour and salt in a medium sized bowl. Add eggs and water, mix until smooth. Heat a 6-inch skillet and oil very lightly. Spoon in a very thin layer of batter, just enough to cover the bottom of the pan. Cook on one side only until done. Turn onto waxed paper. Repeat until the batter is used, stacking wrappers between squares of waxed paper. Set aside. Shell, Devinne and chop shrimp. Slice water chestnuts in thin strips. Dissolve corn starch in 1 tablespoon of water. In a skillet, brown pork. Add garlic, then onion and shrimp. Saute and season with salt and pepper. Add water chestnuts and carrots. Cook briefly until tender. Stir in bean sprouts and cabbage. Add soy sauce and cornstarch-water mixture; mix well and cook for 5 minutes. Cool filling mixture and spoon a tablespoon in Lumpia wrapper. Repeat with remaining filling and wrappers. Serve with Lumpia garlic brown sugar soy dipping sauce. Combine sugar and cornstarch in a saucepan. Stir in soy sauce and garlic. Add broth and mix well. Cook over medium heat until mixture thickens. Server over fresh Lumpia. Final Assessment: This was delicious and easy to make. It didn't really count as a whole meal, but as an appetizer or snack, it's perfect. This recipe made about 20 Lumpia and they disappeared in about 20 seconds flat. oh, Lumpia are *awesome* ! They're really big in Filipino cooking too. These look amazing !! Reminds my of po pia or the Vietnamese fried spring rolls! Springrolls, they look awesome and delicious.